Health questions? We've got you covered A to Z.
Q. What causes respiratory allergies? A. If you suffer from respiratory allergies, you are not alone. Nearly 50 million other Americans have them too. In fact, allergies are the fifth leading chronic, or long-term, disease in the United States and the third most common chronic disease among children under 18 years old. Allergic reactions are caused by an over-reactive immune system. Sometimes, the body mistakes a harmless substance, like pollen or dust, for a dangerous invader. This results in a release of chemicals from immune cells, which can cause sneezing, itchy/runny nose and eyes, rashes or hives, inflamed eyes, skin or lungs. In severe allergic reactions, whole body allergic reactions may require immediate medical attention. Q. What are the different types of allergies? A. There are six main types of allergies. Indoor/outdoor allergies (allergic rhinitis or "hay fever"): most commonly triggered by tree, grass or weed pollen, mold spores, dust mites, cockroach allergens and cat, dog and rodent dander. Eye allergies (allergic conjunctivitis): most commonly caused by the same things that trigger indoor/outdoor allergies, but symptoms are specific to the eyes. Skin allergies (atopic of contact dermatitis): most commonly triggered by plants such as poison oak, ivy and sumac. However, skin contact with dust mite or cockroach allergens, certain foods, or latex may also trigger symptoms of skin allergies. Symptoms of skin allergies include eczema or hives. Latex allergies: Latex is most commonly found in hospital gloves and certain paints. Latex can react with sensitive skin or can be inhaled and cause breathing problems. Food and drug allergies: The majority of food allergies are caused by eight types of foods: milk, soy, eggs, wheat, peanuts, treenuts, fish and shellfish. Penicillin is the most common drug allergy, though there are many other drugs that can cause allergic reactions. Insect allergies: most commonly caused by bee or wasp stings, venemous ant bites and cockroach and dust mite allergens. Q. What is the difference between a cold and allergies? Duration: Colds don't usually last longer than 5-7 days, but allergies can last as long as you are exposed to the allergen (the thing that you're allergic to). Onset of symptoms: Cold viruses take about 3 days (from the time of infection) to cause symptoms. The sneezing, watery eyes etc., from an allergy can happen as soon as you come in contact with the allergen. Allergy symptom characteristics: Allergies never cause a fever or body aches. The following symptoms are more common in allergy sufferers (though they can sometimes be associated with colds as well): itchy, watery eyes, clear mucus that doesn't turn yellow and symptoms triggered by seasonal change. Cold symptom characteristics: The following symptoms are more common in cold virus infections (though they can sometimes be associated with allergies as well): cough, sore throat, thich, yellow mucus and winter-time onset. Unlike allergies, the common cold is often accompanied by fever and/or body aches. Click here to learn more about burping, hiccuping, and spitting-up in babies. Q. Should my infant's car seat face the rear or the front of the car? A. All infants in any state should always ride rear-facing in a car seat until they are 1 year of age and weigh at least 20 pounds. A recent recommendation is to extend the rear-facing position until 2 years of age. Q. Should my child ride in the back or front seat of the car? A. The general rule of thumb is that young children should ride in the back seat of the car in a booster seat until the seat belt, including the shoulder strap, fits them properly. This will come at a different time for each individual child. Rhode Island law states that all children under the age of 7 must ride in a rear vehicle seat. All passangers not secured in a car seat or booster seat, must wear a seatbelt. Q. What are the age, height and weight requirements for booster seats? A. 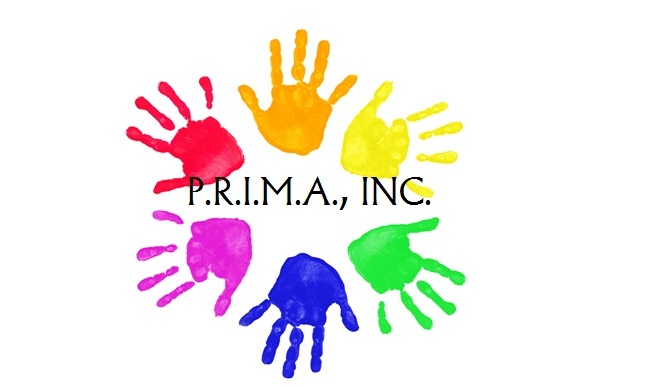 Official Rhode Island law states that children under the age of 7, under 54 inches in height and weighing less than 80 pounds, ride in a federally approved car seat or booster seat. As of 2008, the state of Massachusetts requires that children under the age of 8 and measuring less than 57 inches in height ride in a safety seat. Failure to comply with this law could result in a $25.00 fine. All car and booster seats should be appropriate for the child's age, height and weight and should be used in accordance with the manufacturer's instructions. Click here to learn more about the common cold. Q. What else can I do to help my baby/child through a cold in addition to the above article's treatment suggestions? A. We also suggest placing a cool humidifier in the room to help with a baby or child's cough. Infant vapor rub is safe to use on babies if needed and should be applied to the belly or diaper, not on the chest as it is too strong there. Q. My baby is constipated and can't pass a stool. What should I do? A. If your baby is actively pushing and can't get a stool out, trying rectal stimulation with some vaseline first is a good idea. If that doesn't work, a "Babylax" glycerine suppository is safe, effective and available at any pharmacy. Q. My baby passes stool infrequently and when he/she does, the stool is hard. What can I do? A. If your baby goes infrequently with hard stools, adding karo syrup to either formula or pumped breast milk can work to make stools softer and more regular. Try 1 teaspoon of karo syrup mixed with 2 oz. of formula or pumped breast milk and do that as often as needed. We do not recommend mixing the karo syrup with water. Click here to learn more about croup. Q. What should I do for a fever? How high is too high? A. Remember to call the office right away if your baby is less than 2 months old and has a fever of over 100.4 degrees farenheit. If your child is over 2 months of age, it's a good idea to start with Tylenol for a fever over 101 degrees farenheit. See our Tylenol dosing chart below for more information on proper medication administration. Q. Is it safe to give my child Tylenol, Motrin or Benadryl? A. Tylenol is safe to give at any age in the proper doseage. Children should not receive Motrin until they are 6 months of age or older. Benadryl is generally not used until children are at least 4 months of age. Q. How often should I give my child Tylenol, Motrin or Benadryl? What are they used for? A. Tylenol may be given every 4 hours as needed for pain or fever. Motrin may be given every 6 hours for pain or fever. Both Tylenol and Motrin work equally well for most people. Benadryl may be administered every 4-6 hours in the event of an allergic reaction. Q. My child was recently diagnosed with mono. Can he/she participate in sports or physical activity? A. If your child was diagnosed with mono, he or she should not participate in sports or physical activity for at least two weeks. Your child should also be seen in the office for a follow-up appointment two weeks after he/she is diagnosed to make sure he/she may be cleared to resume full activities. Q. Does my child have a cold or a sinus infection? A. To learn more about the general characteristics of cold and sinus infections, click here. Click herefor summer sun and water safety tips. Q. I found a tick attached to my child's skin. How can I safely remove it? Use a cotton ball soaked in alcohol to gently clean the area of skin around the tick bite. Next, grab the tick with fine tweezers as close to the skin as possible and slowly pull it straight out. Do not use a twisting motion and try not to squeeze the tick's body. If you use your fingers to get rid of the tick, protect them with a tissue, cloth or gloves and then wash your hands thoroughly once the tick is removed. Cleanse the site of the bite with alcohol or another first-aid ointment. Be sure the tick is dead before you dispose of it. Q. Do all types of ticks transmit Lyme disease? How can I tell different types of ticks apart? A. Lyme disease is spread through tiny, black ticks called deer ticks or black-legged ticks. Larger dog ticks, lonestar ticks and the rocky mountain wood tick do not transmit the disease. All four stages of the deer tick. 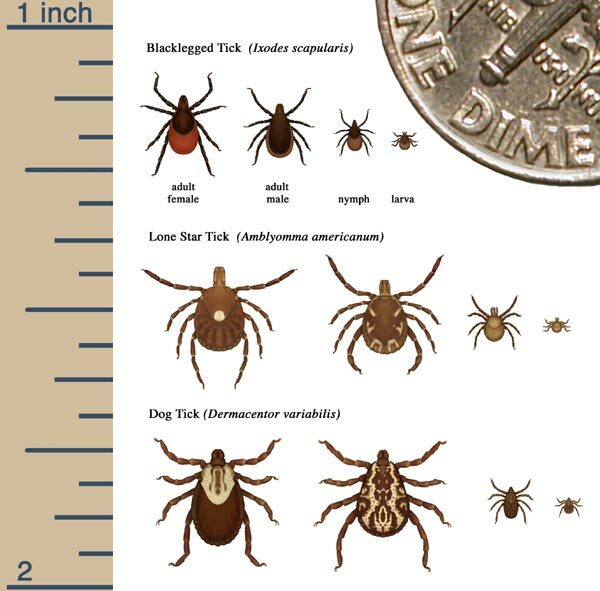 This chart illustrates the various types of ticks. The black-legged or "deer tick," may transmit Lyme disease. Q. How long does a tick need to be attached in order to transmit Lyme disease? A. Ticks must be attached to the skin for at least 36 hours in order to transmit the Lyme disease bacteria. Q. I removed a tick from my child's skin. Does my child need to be on antibiotics to prevent against Lyme disease? A. If the tick was attached for 24 hours or more, or if you are not sure how long the tick was attached, you should contact our office at 401-333-5201. Your child will likely need to be placed on antibiotics to prevent against Lyme disease. If the tick was attached for less than 24 hours, even if it was a deer tick, the chances for Lyme disease are low and your child likely does not need antibiotics. Q. Should I bring my child to the office or an emergency room? Hospital emergency rooms (ERs) are set up to focus on medical emergencies. You will get from a doctor who has probably never seen your child before. It's always best to get as much of your child's care as you can from a doctor who knows and understands your child. It may cost a lot more than it would at your doctor's office. You will probably spend a lot more time there then you would at your doctor's office. Place your baby on his/her back at naptime and at night time. Use a crib that meets current safety standards, with a firm mattress that fits snugly and is covered with only a tight-fitting crib sheet. Remove all soft bedding and toys from your baby's sleep area. The AAP suggests using a wearable blanket instead of loos blankets to keep your baby warm. Breastfeed your baby, if possible. After each breastfeeding session, put your baby back to sleep in his/her own sleep area. You may offer a pacifier when putting your baby to sleep. If you are breastfeeding, introduce the pacifier after one month or once breastfeeding has been established. Put your baby to sleep on any soft surface, including your bed, sofas, chairs, water beds, on quilts, sheet skins, etc. Dress your baby too warmly for sleep--keep the room temperature at approximately 68 to 72 degrees Fahrenheit to avoid overheating. Use sleep wedges or positioners to prop your baby up or to keep him or her on his back. Allow anyone to smoke around your baby or to take your baby into a room or a care where someone has recently been smoking. Sleep is so important to a growing baby. But as new parents, you want to be sure that your baby is sleeping soundly...and safely. 24 hour call-in assistance available. Leave a message and a lactation consultant will return your call. The following are hospital "warm line" numbers that breastfeeding mothers may call upon discharge from the hospital should they have questions or concerns about breastfeeding. Leave a message and an RN/IBCLC will return your call. Appointments are available for mothers after hospital discharge. Women & Infants' Health Education Department provides new parents with a toll-free telephone support system. This popular service, staffed by professional nurses, offers helpful information regarding your new baby, breastfeeding and postpartum issues. The Warm Line also offers breastfeeding tips.